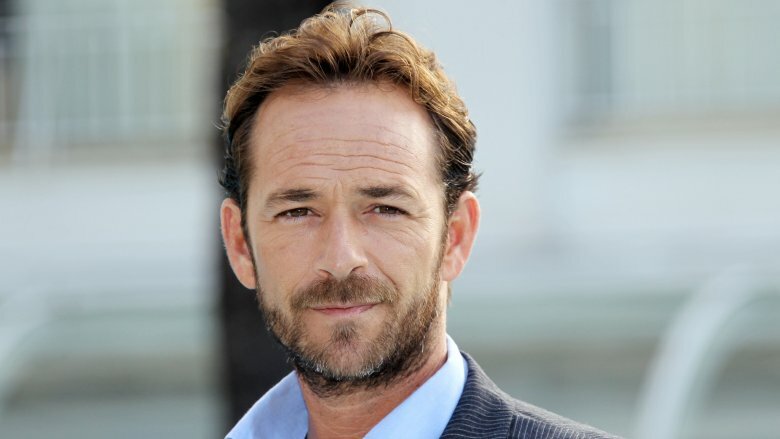 Luke Perry landed in Hollywood from Ohio in 1984, and after a music video and roles in daytime soap operas Loving and Another World, his breakthrough role as resident bad boy Dylan McKay in the mega-hit teen drama Beverly Hills, 90210 turned him into a teen heartthrob and international superstar. Adorning bedroom walls everywhere in the '90s, it appeared he'd be a star and leading man for decades to come, but his career cooled off for a bit. He landed roles in small budget films and a stint on HBO's Oz in the early 2000s, then struck television gold once again in 2017 with The CW's critically-acclaimed Riverdale. But what else do we know about the former teen rebel who later became a proud father of two? Why was he a regular at professional wrestling matches on the California independent circuit? And what is there to know about his early death in March 2019? Let's discover the untold truth of the late Luke Perry. Teen television dramas and movies change with the times, but one archetype always remains — the brooding bad boy. 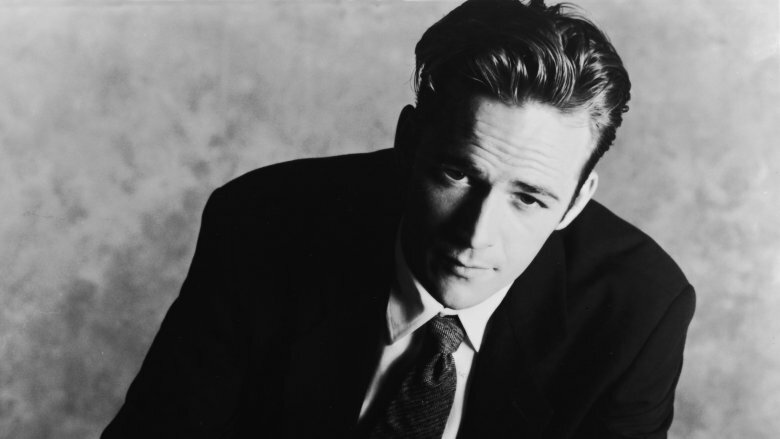 From 1990 to 2000, Luke Perry played tortured soul Dylan McKay on Beverly Hills, 90210. But after he became a dad to a teenage daughter, Perry wanted to keep her far away from his most famous character. During a Facebook Live chat with Us Weekly on March 2, 2017, Perry was asked if he would want his daughter dating McKay. "I know that brother; I know what he's up to," he said. "He's absolutely a man of character, so she could do worse. But it wouldn't be my first pick, no." Dylan McKay was known for his fondness of motorcycles, but Perry noted that he'd prefer that his son wouldn't ride one. "We've got some dirt bikes, but I don't think it is a good idea for anybody to ride on the road," Perry said in full dad mode. He claimed that in Los Angeles, "you see people flying in and out of traffic on those motorcycles — they are just begging for it. Don't do it." In March 2012, Beverly Hills, 90210 alum Jennie Garth split with her husband of 11 years, Twilight vampire dad Peter Facinelli. Citing "irreconcilable differences," Facinelli filed the divorce petition and sought custody of their three children. "You get the rug pulled from under you," Garth told People. "I have no landscape of what my future will look like, where before I had something that I can count on." 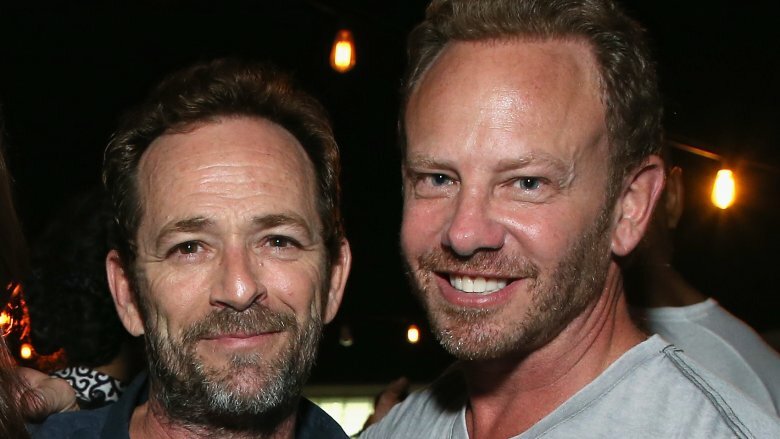 Shortly after the divorce, Garth and Luke Perry were spotted out together, prompting fans and the media to speculate if they were dating. As it turned out, they were just friends who relied on each other for support. "Luke has been one of my friends who I can call and talk about stuff and has been through something himself," she told Today. When asked if there had been romance in the air, Garth told Us Weekly, "No! We're just really close friends. I love him so much, dating him might be weird!" 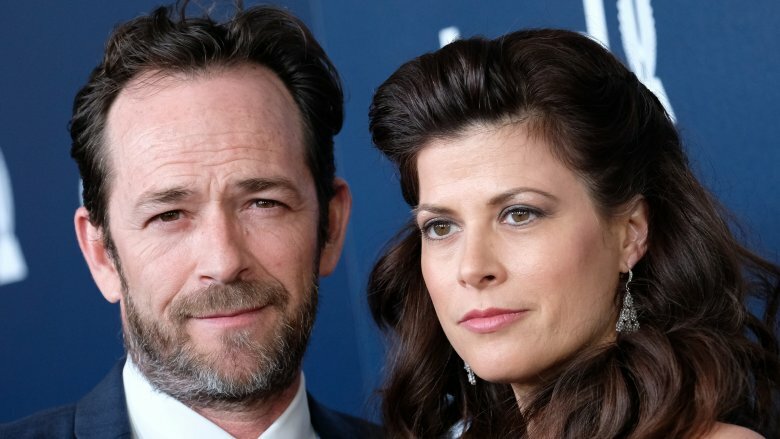 While promoting Riverdale in 2017, Luke Perry told Today that he'd love to play Dylan McKay again if Beverly Hills, 90210 was ever rebooted with the original cast. "I very much would be interested in doing it this time," he said. "I'd like to go back and work with my guys." He added, "Yeah, I've been doing something else and that's been fun, but I'd love to do scenes with Shannen (Doherty) again." On Dec. 20, 2018, Perry's dream inched closer to reality when original cast members Jason Priestley, Jennie Garth, Tori Spelling, Ian Ziering, and Brian Austin Green were spotted by TMZ leaving pitch meetings about a potential reboot. On Feb. 27, 2019, "a six-episode revival of the iconic 1990s hit" was confirmed. According to People, the gang will get back together to play "heightened versions of themselves in a brand-new serialized drama — with a healthy dose of irreverence — that is inspired by their real lives and relationships." Unfortunately, Perry might not have been allowed to play a significant role in the reboot. 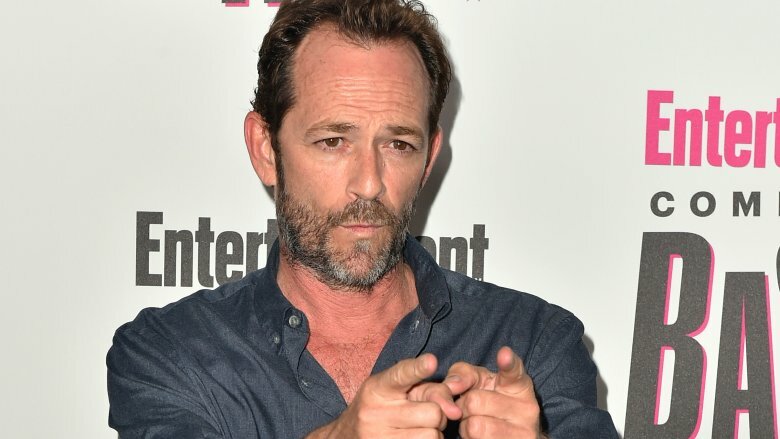 A source told Entertainment Tonight that "at this time, due to his current deal with Riverdale, Luke Perry could only guest star on a potential 90210 reboot, and could not be a series regular." Unfortunately, with Perry passing away in early March 2019, we'll never see Perry take on his famous role again. He lived a very private life, and based on his past serious relationships, one could surmise Luke Perry preferred to date women who were far removed from the glitz and glamour of Tinseltown. He married former furniture saleswoman Rachel "Minnie" Sharp in 1993, according to People, and the couple divorced in 2003 after having two children, Jack and Sophia Perry. Following his untimely death in March 2019, it was revealed that Perry was planning to tie the knot again. This time, he was secretly engaged to licensed marriage and family therapist Wendy Madison Bauer (pictured, right). It was unclear how long the two had been an item, but Bauer was spotted with the Riverdale actor in April 2017, when they attended the GLAAD Media Awards. "They appeared to be smitten with each other as they held hands and walked the red carpet together ahead of the star-studded event," Us Weekly reported. Bauer, as well as Perry's children, his ex-wife, close family members, and friends, were all by his side during his final moments. He didn't just entertain us on the big and small screens. The 8 Seconds star also never hesitated to lend a helping hand to those in need, and countless stories about his generosity have emerged following his death. The Sun recounted a story told by a social media user who revealed that Perry once kept a pair of screaming kids entertained on an airplane by leaving his first-class seat, blowing up a balloon, and handing it off to the kids "like he's holding out a sword to a king." He also took time out of his busy schedule in May 2010 to team up with the Nashville charity Soles4Souls to help those affected by a catastrophic flood that ravaged the states of Tennessee and Kentucky. On the charity's website, Perry appears in a photo all decked out in a bright red poncho and a pair of shorts, tirelessly working in the pouring rain and without fanfare to help distribute "more than 1 million bottles of water and Gatorade, along with sandals, socks, food and clothing" to flood victims. 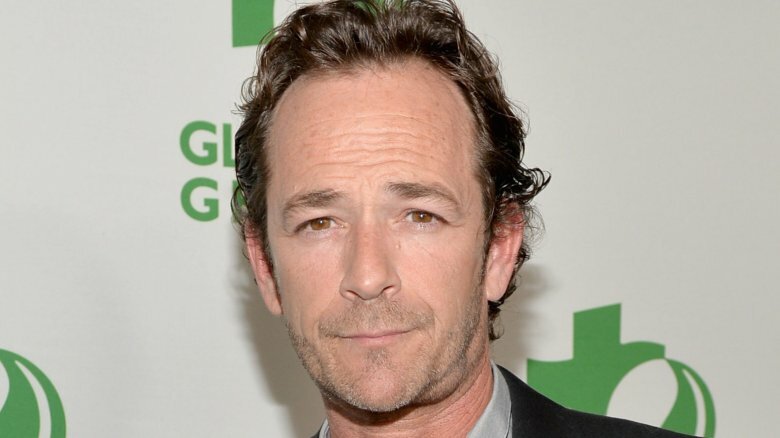 Luke Perry told Sway in the Morning that he went on 256 auditions before he landed his very first gig. To maintain a healthy perspective, he handled the rejection by thinking: "You know, I just walked out of a room full of fools. Those people have no idea." Perry finally landed his breakout role on Beverly Hills, 90210 in 1990, and his rugged good looks and radiant charm have been captivating audiences ever since. But Perry wasn't really a fan of his own work. When Us Weekly asked if he would be tuning in to Lifetime's The Unauthorized Beverly Hills 90210 Story in 2015, Perry said he wasn't going to watch the re-enactments portrayed in the tell-all. "I don't even watch my own actual self on TV," he said. Perhaps his aversion to watching himself on the tube had to do with his upbringing. He told Adweek in 2013: "When I was a kid, I just devoured TV 24 hours a day. Now that it's actually available 24 hours a day, I'm usually busy doing other stuff." Beverly Hills, 90210 became a global pop culture sensation, while simultaneously introducing us to our favorite Gen-X heartthrob, Luke Perry, who portrayed West Beverly Hills High School's favorite bad boy to a tee. The show is now deemed a teen cult classic, and decades later, Lifetime gave us a peek at the behind-the-scenes drama and scandals surrounding the series in the 2015 special The Unauthorized Beverly Hills 90210 Story. Us Weekly caught up with Perry at the Television Critics Association press tour in July 2015 to ask for his thoughts about the tell-all. Surprisingly, he didn't want to talk about the show. Period. "Third grade," he replied. "How much does that matter to you? Exactly. It's just not relevant to anything I'm doing. Next question?" It was true. His career had certainly evolved and he was tackling more mature roles at that point. 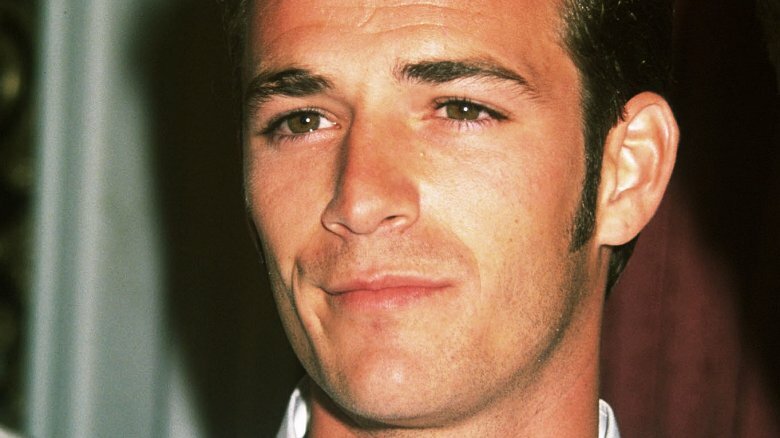 Though he'll always be Dylan McKay to us, we are grateful we got to experience other dimensions of his work through shows such as Oz and Riverdale. His many professional and personal pursuits will be sorely missed. A routine colonoscopy in 2015 revealed precancerous growths that were quickly removed from Luke Perry's system. After his cancer scare, he joined "advocacy group Fight Colorectal Cancer" to spread awareness about the importance of getting screened, reported Fox News. Screenings are important, because according to the American Cancer Society, "nearly 96,000 new cases of colorectal cancer and about 40,000 new cases of rectal cancer are diagnosed each year in the U.S."
"Right now, there are 23 million Americans who haven't been screened who need to be screened," Perry told the network in 2017. "If I had waited, it could have been a whole different scenario." Perry explained why it was important to him to use his fame to raise awareness. "When I heard that this was the most detectable cancer that we know of yet it's the second most lethal, I just couldn't figure out why that was and I wanted to get out there and tell people about it," he said. 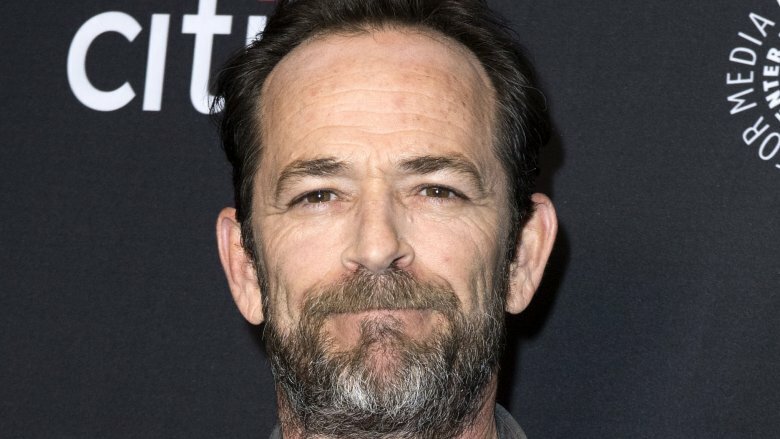 On Feb. 28, 2019, Luke Perry reportedly suffered a "massive" stroke, according to TMZ. The site said Perry was "responsive and talking" when paramedics arrived, but "his condition deteriorated," leading paramedics to rush the Riverdale actor to the hospital. Perry was reportedly placed in a medically induced coma, though his rep denied the claim and revealed that the actor was sedated instead. As the news of Perry's condition spread, the actor's current and former co-stars, as well as other celebrities, sent him their best wishes. "I wish him all the best, because you can come all the way back even from the edge, from the worst things, I'm here to tell you," actress Sharon Stone, who suffered a stroke in 2001, told Extra. Hayley Law, who plays Valerie Brown on Riverdale, tweeted: "Luke Perry. I'm praying for you. Asking god to be with you and help you get through this to help you recover stronger." Cole Sprouse, Riverdale's Jughead Jones, posted a pic with Perry on Instagram with the caption, "Love you bud." 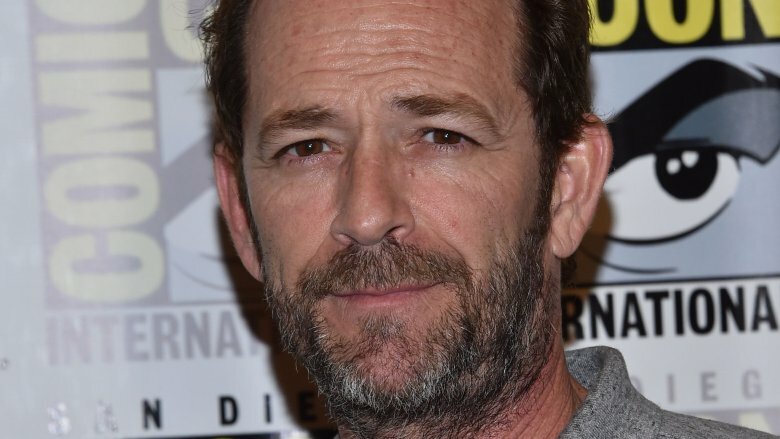 Sadly, Luke Perry would not recover from his stroke, and he passed away on March 4, 2019, according to TMZ. The damage caused by the stroke was reportedly "too extensive" and Perry died at St. Joseph's Hospital in Burbank, Calif., surrounded by loved ones. He was 52 years old.